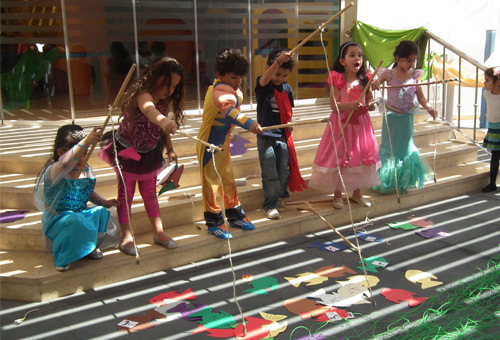 Maadi Community School is a multinational school in the heart of Cairo. Faced with limited indoor and outdoor space coupled with an increasing school population, the school needed a creative solution to their accommodation challenge. With a new Reception year intake, the school were also keen to develop a dedicated outdoor space. Anita from Maximising Learning visited the school in the Spring of 2014, initially to discuss this potential new outdoor area. She encouraged the school to take a step back and look at the whole space, thinking of it as part of the school’s whole learning environment. MCS is an extremely inclusive and friendly school, at the heart of the local community, so it seemed obvious to fully involve all the children and staff in the development of their new space. Staff worked with the older pupils to design a consultation process which would allow every child in the school to have their say, and which would also link to their curriculum, allowing contextual learning in subjects such as maths and English. Guided by Maximising Learning we initiated a survey of every child in the school asking them what they wanted to do in school, asking them to remember back to when they were tiny, what did they love to do. We deliberately didn’t ask them what they wanted to have, we were more interested in what they wanted to do. We were stunned by the results. Using the children’s’ feedback, and concentrating on how the space could be used for both learning and play, the school came up with some simple yet very effective ideas, providing numerous opportunities for imaginative, messy and physical play. The project is ongoing, and the school are making best use of their limited outdoor space, including a hydroponic garden on the roof. Maximising Learning continues to support the school from the UK, and we are very excited to see what they do next. We helped Maadi Community School achieve their goals. Get in touch now to find out how we can help you reach yours.